This orchid from the Philippines is a special piece of nature. Paphiopedilum philippinense has a unique flower with two black purple striped petals and two dark purple curled petals. The variation roebelenii grows these stringy flower petals up to 22,5 centimetre. The lip of Paphiopedilum philippinense is shaped like a slipper. Paphiopedilum philippinense is found in the wild on the Luzon island of the Philippines. This variation has been especially selected to make its helix shaped flower petals even longer. They hang downwards from the side of the flower and have a dark purple colour. The other two petals are oval with a point and have a blackish purple colour. As if this wasn't interesting enough, the lip is also special as it has the shape of a clog or slipper. The plant can grow multiple flower stems each carrying one flower. The leaves are around 15 centimetre and shaped like a knife. Paphiopedilum philippinense var. roebelenii is that special orchid that can't be left out of any collection! Put Paphiopedilum philippinense in a light spot, out of direct sunlight. The humidity should be quite high, around 80%. 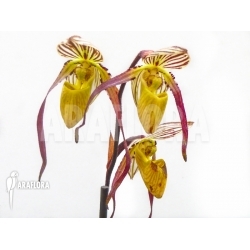 The ideal temperature for Paphiopedilum philippinense is around 25⁰C. Avoid letting the temperature drop below 15⁰C or rise above 35⁰C. Water the plant with rainwater or distilled water when the substrate has dried slightly. In practise this will be three to five times a week. Combined with a proper airflow this will help prevent infections and disease. Orchid-mix is a suitable substrate, as long as water is able to drain from it. You can find orchid-mix and other components in our ‘Plant Accessories’ section. This orchid needs little or no fertilization. Old flowers can be cut from the plant.